Gravity. From Physclips: Mechanics with animations and film clips. This is a supporting page to the multimedia tutorial on gravitation in Physclips. In some parts, it gives a little more detail and discussion, and it has some derivations and appendices. Gravity is a puny force. If you stand next to a tank containing many tons of water, you don't even notice its gravitational force on you. As we shall see, to produce substantial gravitational force, one of the objects has to approach planetary size. Let's compare gravity with electricity: A hydrogen atom is an electron and a proton. The electric attraction between them is larger than the gravitational attraction by a factor of 5 x 1039. The attractive force that holds the nucleus together -- aptly called the strong force -- is stronger than the electric force over short range: if the nucleus is small enough, the strong force 'wins' and the nucleus is stable. (However, large nuclei are unstable: they divide by radioactive decay: elements with atomic number above about 90 are usually radioactive because the electrical repulsion among 90 protons tends to defeat the attraction of the strong force.) This appendix has a chart showing the known forces and some relations among them. So why does gravity rule the universe? Nuclear forces only have a finite range ­ about the size of nucleus. (This finite range is determined by Heisenberg's Uncertainty Principle, using an argument that won a Nobel Prize for Hideki Yukawa.) Electromagnetism and gravity both have very large, perhaps infinite range. Electric charge comes in positive and negative, which cancel. The earth contains almost exactly the same number of protons and electrons, so its electrical field is small. In contrast, mass is always positive and, for gravity, every mass attracts every other mass. So gravity runs the planets, the stars, the galaxies, galactic clusters... Let's see how. Acceleration is the rate of change in velocity. Imagine you're driving at a fixed speed: you push the accelerator, and your speed increases: this is a positive forwards acceleration. But you also need brakes to stop: a force is required to decelerate. Forces cause accelerations, and also decelerations, which are just negative accelerations. One of Galileo's and Newton's insights was that the 'natural' condition was not zero speed but zero acceleration. If there are no forces -- no friction, no air resistance etc -- then an object at rest remains at rest, and a moving object continues moving at a constant speed in a straight line. This is Newton's first law of motion. Force and accleration are vectors, meaning that they have direction, as well as magnitude. If the total force on a body is in the North direction, then it will accelerate North. Force is measured in newtons (abbreviation N). One newton is the force required to accelerate one kg at one metre per second per second. A newton is about the weight of a small apple. Newton's law of motion says that a force is required to get an object moving (an acceleration in the direction of its motion), or to stop it moving (a negative acceleration in that direction). A force is also required to change the direction of its motion because, as we shall see, that is also an acceleration. Note that mass is not the same as weight. If your mass is 70 kg, then your weight on earth is 70 kg multiplied by the earth's gravitational field, which is about 10 metres per second per second. So your weight is 700 newtons. Suppose you went to the moon, where the gravitational field is six times smaller. Your mass would still be 70 kg -- you would still be made of the same amount of material -- but your weight would be only 120 newtons. On the moon, you would fall more slowly and it would take less force to hold yourself upright, but it would still take the same force to accelerate you. You're standing in the bus when it starts moving forwards (when it accelerates forwards). You are holding onto the grab bar. The floor of the bus pulls your feet forward, the grab bar pulls your arm and body forward - you accelerate forward with the bus. Another passenger is not holding the bar. His feet accelerate forward with the bus, but not his body. The bus accelerates forwards, he falls backwards. When the bus driver brakes, the reverse applies. The bus and the rail apply a backwards force on you, and you decelerate (ie accelerate in the negative or backwards direction). The body of other passenger, however, continues forwards while the bus slows. The bus decelerates (ie accelerates backwards), he falls forwards. What happens when the bus turns to the right, at constant speed? According to Galileo and Newton, an unrestrained passenger would tend to continue travelling in a straight line. For the passenger not holding the grab bar, his feet turn the corner with the bus, but his body keeps going forwards. The result is that he falls to the left. In this case, the bus accelerates to the right, he falls to the left. So an object travelling in a circle at constant speed is always accelerating but, because the acceleration is towards the centre of the circle (it's called a centripetal acceleration) it doesn't add to or subtract from the speed. A force that causes a centripetal acceleration is called a centripetal force. Let's now look at some accelerations and forces. These film clips use a spring to accelerate a bowling ball. You can tell whether the spring applies a force from whether it is stretched or not, as in these photos. See more of these film clips below. In 1687, Isaac Newton wrote "I deduced that the forces which keep the planets in their orbs must be reciprocally as the squares of their distances from the centres about which they revolve; and thereby compared the force requisite to keep the Moon in her orb with the force of gravity at the surface of the Earth; and found them answer pretty nearly." Here, \translated into modern units, is Newton's calculation of the centripital acceleration of the moon due to its circular orbit around the earth. Its direction is towards the earth. We can work out its magnitude from our equation ac = 4π2r/T2, using the distance from the earth to the moon (380,000 km) and its period of 27.3 days. The negative sign is used to mean an attraction. If m1, m2 and the separation between them are positive (and they always are -- there are no negative masses), then the gravitational force between them is attractive. As we saw above, this is why gravity always wins on the large scale. The force is proportional to each of the masses. This is not surprising: experimentally we find that two apples, side by side, fall with the same acceleration as one apple, so the force on twice the mass is twice the force on one. There is a constant of proportionality, G, the universal constant of gravitation, which we can measure – see below. Gravitational forces, like all forces ever discovered, come in pairs that are equal and opposite. If m1 attracts m2 with a force F, then m2 attracts m1 with a force -F. The observation that all forces come in such pairs is Newton's third law of motion. The r2 in the denominator means that the attraction gets weaker in proportion as the square of the separation. Why is gravity inverse square? is an interesting question, and one explanation is geometrical. If we picture field lines radiating uniformly from a symmetrical mass distribution, the intensity of the field (the number of field lines per unit area) is the total number of field lines (say N) divided by the area of a sphere, which is 4πr2. So the field strength is N/4πr2. This description is rarely used for gravity. In electricity, however, the analogous relation between geometry and the strength of the field is standard and is called Gauss' Law. Magnetism is also an inverse square law, and one of Maxwell's equations is usually called Gauss' law for magnetism. If we were to use the same mathematical formulation for gravity as for electricity and magnetism, we should also have a factor 4π in the denominator. However, for gravity, the factor (1/4π) is absorbed in the constant G.
So the 1/r2 factor that it comes from the fact that we live in a universe with three dimensional*, approximately flat spatial geometry. In a flat space, the interior angles of triangles add to 180°, the area of a sphere is 4πr2 and electromagnetic and gravitational force are proportional to 1/r2. If the angles of a triangle added to less than 180°, then these forces would decrease more strongly with r and conversely. * This argument applies only to dimensions that are large enough to be measured. Gauss' law does not rule out the existence of further dimensions, provided that the entire size of the universe in these dimensions is smaller than the smallest size we can measure. This is the escape clause available to supporters of m theory and string theory. One could argue that some nuclear physics experiments measure on the fm scale, so that the size of the universe in any putative higher dimensions must be rather smaller than this. Inertial mass, gravitational mass and Mach's principle Why does gravity seem to depend on the (inertial) mass? This is another interesting and profound question: the same quantity, mass, that appears in Newton's equations of motion, also appears in Newton's (or Einstein's) law of gravitation. This is not due to a lack of imagination on Newton's part: he thought carefully about this coincidence. Because the two are conceptually distinct, let's separate them. The inertial mass mi is the constant of a body that appears in Newton's combined first and second law, F = mia. It is the constant that quantifies the body's reluctance to be accelerated. The gravitational mass mg is the constant of a body that appears in Newton's law of gravitation, F = − GmgMg/r2. It quantifies the body's interaction with the gravitational field. Why are they the same? Experimentally, they are the same: Newton and many others since have conducted experiments. Or rather, they are proportional, because we could consider G to include any fixed ratio mi/mg. What sort of experiment? Here's an example: take a pendulum consisting of a light hollow container suspended on a light string. We then fill the container with the substance to be tested. In the analysis of the pendulum, the restoring force is proportional to mg. The acceleration is inversely proportional to mi. If the two are proportional, then we find that the period of the pendulum does not depend on the mass. So, we can conduct a series of tests on different substances to see whether the period varies. For instance, if we used water or octane, we should have a relatively high ratio of protons to neutrons. If we use a heavy metal, a low ratio of protons to neutrons. So we can test whether mg/mi varies between protons and neutrons. Another sort of experiment would be to compare the accelerations of objects in one or more gravitational fields. We give examples in this link. One reponse is that this it is not a coincidence, and that the interactions among masses give rise to inertia. This is called Mach's Principle. Another approach is to propose that mi and mg are not merely proportional, but really are the same thing. This is a starting point for Einstein's theory of General Theory of Relativity. The proportionality of mi and mg has been and is still being tested in a number of several very sensitive experiments. We discuss it in the section on gravitation in this link. Newton showed that the gravitational effect of a spherically symmetric body is the same as it would be if all its mass were located at its centre (provided that you are outside the body). Planets and stars are nearly spherically symmetric, so one can calculate their gravitational effects using separations from their centres. To prove this requires some mathematics, so we do that in this separate file. It is difficult to measure G simply because gravity is so weak: the forces between masses than can be manipulated are small. 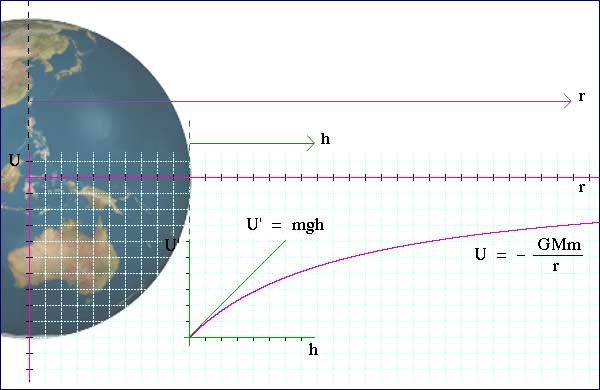 Of course one can easily measure the gravitational force between the earth and another object -- that is what we call the other object's weight -- but to get G we need to know the mass of the earth, and we do not know that without G.
Two large masses are mounted on a rod, which is suspended by a thin wire. When the wire is twisted, it tends to untwist itself (technically, it exerts a restoring torque proportional to the angle of twist). This can be calibrated: one can determine the forces required at each end of the rod to twist the wire by a given angle (for instance, this can be determined by rotating the rod, letting it go, and measuring the frequency of its oscillation). Once the system is stable, two large, known masses are positioned near the masses on the rod. The tiny gravitational attraction between the pairs of masses twists the wire slightly, and the force is calculated from the new equilibrium position. In the diagram, the angle has been exaggerated. In practice, the deflection may be very small, but can be measured by mounting a mirror on the rod and measuring the deflection of a beam of light projected onto a distant screen. Here is a link to a Do it yourself Cavendish experiment. From the deflection and the calbration of wire, Cavendish calculated F. He already knew m1 and m2, so he calculated the constants of proportionality for gravity. In modern versions of this experiment, we say that we measure G. Its value is G = 6.67 x 10-11 Nm2kg-2. In other words, two masses, each one kg and separated by a metre attract each other with a force of 0.00000000007 newtons. Cavendish used his measurements to determine the mass of the earth, Me. An object of mass m at the earth's surface is Re from the earth's centre. The magnitude of its weight is approximately* mg, where g is the acceleration it has in free fall. Although measurements of the constant of gravitation are now much more accurate than those made by Cavendish, G is still the least well known of the fundamental constants, simply because gravity is so weak. Let's illustrate this with some values. What about the gravitational attraction between two 70 kg people sitting 0.4 m apart? Here, Gm1m2/r2 is 2 micronewtons, which is too small to feel, even with the tip of the finger. Two conclusions follow. One is that we can usually neglect gravity unless at least one of the bodies approaches planetary size. The second conclusion is a quotation attributed to Albert Einstein "Gravitation cannot be held responsible for people falling in love". and what has been known, after a metaphor used sometimes attributed to Pythagoras, as "the music of the spheres". For two millenia or more, understanding the motion of the planets was one of the great goals of philosophers. This appendix may give some idea of the importance attached to this question. As long ago as the fifth century BC, Leucippus and Democritus proposed a heliocentric universe, i.e. one in which the planets orbit the sun. On the mistaken assumption that the earth's motion ought to be noticeable, Hipparchus (second century BC) and Ptolemy (second century AD) proposed a universe in which the sun and planets executed complicated motions around the earth. The Danish astronomer Tycho Brahe (1546-1601) made very many, very careful, naked eye observations of the positions of the planets. He was joined by Johannes Kepler, a tireless calculator. After a long time trying to fit circular orbits and even musical harmonies to the data, Kepler eventually discovered that the data were all well fitted by the following empirical laws. 1. All planets move in elliptical orbits, with the sun at one focus. 2. A line joining the planet to the sun sweeps out equal areas in equal time. i.e. Planets move more slowly at apogee (distant), more rapidly at perigee (close). 3. The square of the orbital period (i.e. the planet's 'year') is proportional to the cube of the semi-major axis of its orbit. Slow orbits for distant planets, fast for close. So, because |L| is constant, then in any given time δt, δA is constant. Several hundred exoplanets have been discovered in the last two decades. Sometimes they are discovered because they pass between the star and us, giving a partial eclipse and this slightly lowering the brightness of the star. Obviously, this only works if we happen to lie exactly in the plane of their orbit. The general method combines Kepler's laws and the doppler effect. We discuss this and show an example in Electromagnetic radiation, the Doppler effect, exoplanets and cosmology. Newton gave this nice idea to help explain orbits. First, consider a projectile (Newton imagined a cannonball) fired horizontally from the top of a mountain, over a distance small enough that the earth's surface can be considered flat. No matter what its horizontal speed, its vertical acceleration is g downwards. If we fire it very fast, however, we can no longer neglect the curvature of the earth. At a particular value of the horizontal velocity (about 28,000 k.p.h. ), the curvature of the path of the cannonball will match the curvature of the surface of the earth. The cannonball still accelerates downwards at g, but g is now the centripital acceleration of its circular motion, as shown below. and G = 6.67 x 10-11 Nm2kg-2 and Me = 5.97 x 1024 kg, we get an orbital radius of 42,000 km. In the animation, the size of the earth and the orbit (but not the satellite) are to scale. This orbit is very useful for communications satellites: if you point your dish towards the satellite, you don't have to move it. The subject of satellites and the International Space Station raises the topic of free fall and a phenomenon that is ufortunately called "weightlessness". Physicists usually put the word in quotation marks because, in an orbiting spacecraft, an astronaut's weight (his gravitational attraction towads earth) is virtually normal. Indeed, since the moon flights stopped, no human has been far enough from the Earth for his/her weight to be substantially reduced. This may seem puzzling, so let's look more closely. Even on earth, we do not directly sense our weight, because it is applied homogeneously over the whole body. However, if you are seated, you can feel your chair pushing upwards on you with a force of several hundred newtons. The upwards force from the chair and your equal in magnitude your weight (a downwards force). You can also feel your abdominal muscles holding your internal organs in place. These and some other forces give you the sensation of having weight. If the forces from the chair and on your abdominal wall were reduced or zero, you would feel "weightless" – an exaggerated version of the feeling you get when a lift starts to accelerate rapidly downwards, or when you go quickly over a peak on a roller coaster. The three diagrams below show situations that produce free fall. In an orbiting spacecraft, the spacecraft and the astronaut are both accelerating towards the centre of the earth at the same rate. (Their centripetal acceleration is ac = rω2 = v2/r, where ω is the angular velocity, v is the orbital speed and r the radius. In low earth orbit, ac ≅ g.) Their weight – the gravitational force exerted on them by the earth – is what keeps them in orbit: W = mac. However, because they are both accelerating towards the centre of the earth at the same rate, there is on average no force between the astronaut and the spacecraft. This absence of forces from seat, floor, abdominal wall etc is what is commonly but misleadingly called "weightlessness": the astronauts in the space station are not without weight, in fact they have (almost) their usual weight. It's just that they don't feel the force of chairs and floors supporting them, and they don't feel their abdomens holding in their organs. In the figure in the middle, the cable of a lift (elevator) has broken. Both the lift and its unlucky passenger are in free fall, accelerating downwards at g. The passenger no longer feels the force on his feet and abdominal muscles, and so, like the cosmonaut, he might say that he feels "weightless". He is not, of course, without weight. His weight is still W = mg. Indeed it the weight of the passenger (and lift) that will probably lead to tragedy, because his unopposed weight is continuously accelerating him downwards. In figure at right, a NASA airplane (nicknamed the 'vomit comet') cuts the power in its engines and, for about 25 seconds, travels in a trajectory that is nearly parabolic (none of the diagrams to scale, of course). Both the plane and its occupants accelerate towards the Earth at g: all are in free fall. Astronauts are thus exposed to free fall and obtain brief periods of experience in working in the condition of free fall and feeling "weightless". It is a common simplification to say that 'the moon's orbit is a circle about the earth': the gravitational attraction of the moon towards the earth provides the centripetal force for the moon's orbit. From Newton's third law, of course, the moon attracts the earth with a force of equal magnitude, which accelerates the earth. So the earth and the moon each trace (almost perfectly) circular orbits about their common centre of mass. The sketched below illustrates this, but is not to scale. Magnitude of force on the earth due to moon: Fg = meae = meω2re. An interesting paradox: why doesn't the moon fall into the sun? Calculate the point on a line between earth and sun at which the gravitational forces exerted on a mass m by the earth (Fe) and the sun (Fs) are equal and opposite. Doing the calculation, we find that the point of equal attraction lies 260,000 km from the earth. But the moon is 380,000 km from the earth! At new moon, the point of equal attraction lies nearly on a line between the earth and the sun (during a solar eclipse, it lies exactly on this line). So, at new moon, will the moon fall into the sun? The problem and the calculation are described here. But I'm not giving answers: it's for you to solve! When you lift something up, you expend energy -- you do work on it. This energy is stored, in the sense that you can get it back again. It is called gravitational potential energy. For instance, during periods of low electricity demand, energy authorities in Australia use electrical energy from coal-fired power stations to pump water up the Snowy Mountains into high dams. In periods of high demand, they can then let it flow back downhill to get back the gravitational potential energy of that water via the hydroelectric generators. U' ≡ U(r) − U(re) ≅ (GMem/r)(r − re) ≅ mgh. The quotation "What goes up must come down down" is sometimes attributed to Newton. In fact, it was he who proved quantitatively that what goes up need not come down. Let's see why. The following animation uses the graph of potential energy U(r) to show the path of a projectile launched vertially upwards. The kinetic energy K is shown in red, the potential energy U in purple (both histogram and graph) and the total mechanical energy E = U + K is shown in white. Here, E < 0 so, when K goes to zero, U is still negative. For the earth, vesc = 11 km.s−1 = 40,000 k.p.h. The animation below shows an object launched at this speed, i.e. with E = 0 , and so, at all times, K = −U. 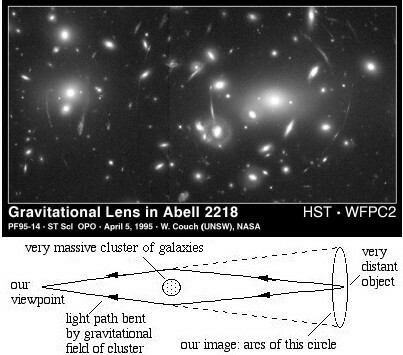 The image shows the gravitational effect of a very massive cluster of galaxies in the right of the frame. This acts like a magnifiying but distorting lens, so that the light from a localised source, located beyond the cluster but on the same line, appears to us as arcs of a circle centred on the cluster. The sketch is not to scale. Image by Warrick Couch, Physics, UNSW, using the Hubble Space Telescope. Click on image to enlarge. From the equation above, we see that a very massive (large M) and compact (small R) object has a very large escape velocity. If we combine the laws of gravity and those of electromagnetism, we might ask how small a given mass must be if its escape velocity equals the speed of light. John Mitchell explained in 1783 that dark stars were possible: stars so dense that no light escapes. We now call such objects black holes. the 'event horizon' of the black hole. If M lies inside Rblack, then no light escapes outside. Having c2 in the denominator means that this radius is small. For an object with the mass of the earth, it is = 9 mm. The earth is not going to contract to this size, so it won't become a black hole. For the sun, the value is 3 km. The sun is currently made of plasma, so one might ask whether, when it cools and shrinks, it could become a black hole. After all, it is electrically neutral, which reduces the possible repulsion due to electric forces, and nuclear forces, though strong, have a small, finite range. The answer is no: for the sun, the repulsive forces among the atoms are strong enough to prevent gravity from turning it into a black hole. For stars somewhat bigger than the sun, however, these forces are not large enough, and only repulsive nuclear forces are strong enough to resist gravity. Such stars become neutron stars -- like a giant nucleus, in which gravity, intensified by having a huge mass within a diameter of several km, is the main attractive force. Finally, for yet larger stars, even nuclear forces do not provide strong enough force to resist gravity. The result is a black hole, from which light cannot escape. Although it is black -- emitting no light -- radiation can be produced near the black hole. However, this is not how we can find them. The only way we can find them is from the effect of their gravitational field on other stars (as shown in the multimedia tutorial on Physclips) or on light (the effect is like that shown at right). So far, we have only mentioned Newton's theory of gravitation. Although it is an excellent theory, it does not agree with experiment if one investigates extremely large fields, or moderately large fields with very high precision. In other words, it is wrong. However, it is such an excellent approximation that Newtonian gravity is what we use to calculate in almost all circumstances, while recognising that it is just a very convenient approximation to more exact theories. To be accepted, any new theory of gravity must give virtually the same answer as Newton's in all of the many cases where Newton's theory works, but must also give the right answer for the cases where we know that Newton's theory fails, such as the slight deflection of starlight passing very close to the sun (observable during a solar eclipse) and certain aspects of the orbit of Mercury that cannot be accounted for by considering the effects of the other planets. Several other theories do this, of which one of the simplest and by far the most widely used is Einstein's General Theory of Relativity. Philosophically, General Relativity is very different from Newtonian gravity, in that it doesn't use forces. Rather, the effect of large masses is to curve space, and the curvature of space determines the motion of objects. It is often summarised thus: "matter tells space how to curve, and space tells matter how to move". So, if there are several competing theories that all do better than Newton's, what theory of gravitation should we use? The mission of Gravity Probe B was to conduct experiments to distinguish among some current theories of gravitation, but it had limited results. However, both Einstein's and Newton's theories of gravity have a problem when they encounter quantum mechanics, and that problem involves the very nature of space and time. We explain this further on Gravity, relativity and quantum mechanics. Fortunately, the scale of the problem is that of the Planck length, which is 1.6 x 10-35 metres. This is immeasurably small, and it is perhaps not too surprising that our ideas about space would need to be revised on this scale. While we're on the subject, let's be quantitative about these limits, and let's look at Newtonian mechanics from other perspectives. Newtonian gravity is accurate if the gravitational potential energy Ugravis much less than the proper energy mc2. At the earth's surface, Ugrav/mc2 ≅ 7 x 10−10. So, unless you are looking for very high precision, Newtonian gravity is an excellent approximation. However, time is often measured very precisely, and such precision is used in navigation systems. So general relativistic corrections cannot be neglected in such applications. Newtonian mechanics is accurate if relative velocities are small compared with that of light. For a jet airliner, v/c < 10−6. Macroscopic objects travel much more slowly than c, but atomic particles and especially electrons are regularly accelerated to high speeds. Again, timing and navigation systems sometimes require the precision that obliges relativistic calculations. Newtonian mechanics is also limited by scale. It is accurate if the product of momentum and a typical length is much greater than Planck's constant, h. For a small molecule at room temperature, (momentum*size)/h ~ 10. For a molecule in a gas, the typical size of the container is large compared to the molecule, so classical mechanics is fine, unless the temperature (and therefore the molecular speeds) is very low. On the molecular scale, however, Quantum Mechanics begins to be important. For low mass objects, such as electrons, and especially at lower temperatures, momentum*size may be much less than one, and quantum effects may dominate. macentrip = N + Fg or −N = Fg − macentrip. Now re(cos θ) ω2 is 0.034 m.s−2 at the equator, less at other latitudes and zero at the poles. Usually, we then make the approximation that re(cos θ) ω2 << g = 9.8 m.s−2, so N ≅ Fg. The diagram above may seem odd, because the vertical of the string is not at right angles to the horizontal. That's because, in that diagram, we exaggerated the angles of the forces, but didn't consider the effects of rotation on the shape of the earth. So, let's hang the mass on a string and leave it at rest, with respect to the earth. As shown, the tension in the string will be almost the same as mg, but not quite. The string hangs vertically, by definition of vertical. However, this direction is not quite parallel to Fg and it does not point exactly at the centre of the earth. A similar argument determines the shape of the earth. The surface of a bowl of water is horizontal, by definition. Here, the normal force and the gravitational force acting on a mass at the surface of the water must also add to give acentrip,, otherwise the water would flow out of the bowl. So the surface of the water – horizontal – is at right angles to the string in our example. The earth's shape is determined by the the forces on it and, on a large scale, it is very close to that of a drop of spinning fluid so, the earth's (large scale average) surface is also, roughly, at right angles to the string. In the animation below, the rate of rotation is exaggerated so that the difference in angle and the tiny eccentricity of the earth's shape – both very tiny in practice – can be seen. What happens if you spin so fast that the string points away from the axis of the earth? The next animation shows this unhappy (but unlikely) result. The film clips below use a spring to accelerate a bowling ball. You can tell whether the spring applies a force from whether it is stretched or not, as in these photos. Use the step frame button on the film clips. See also the section on circular motion, in which this derivation is animated. Faustus: I am resolv'd: Faustus shall ne'er repent. Tell me, are there many heavens above the moon? Feign'd but are erring stars. Faustus: But tell me, have they all one motion, both situ et tempore? Mephistopheles: All jointly move from East to West in twenty-four hours upon the poles of the world; but differ in their motion upon the poles of the zodiac. Hath Mephistophiles no greater skill? The second thus: as Saturn in thirty years; Jupiter in twelve; Mars in four; the Sun, Venus, and Mercury in a year; the moon in twenty-eight days. Tush, these are freshmen's suppositions. But tell me, hath every sphere a dominion or intelligentia? Faustus: How many heavens, or spheres, are there? Mephistopheles: Nine: the seven planets, the firmament, and the empyreal heaven. Faustus: Well, resolve me in this question: Why have we not conjunctions, oppositions, aspects, eclipses, all at one time, but in some years we have more, in some less? Faustus: Well, I am answered. Tell me who made the world. Are we ready now for the Age of Enlightenment? I cannot resist making the following observation. Someone who lived in Elizabethan England could have attended premières of three plays in which three of the greatest playwrights of the language each make a hero or anti-hero of the scholar/ philosopher/ magus: Marlowe's The Tragickal History of Doctor Faustus, Shakespeare's The Tempest and Jonson's The Alchemist. Very different views, but with interesting common perspectives. And each with insights that have some direct relevance to our 'brave new world'. Not to mention fabulous writing – the extract above doesn't doesn't do them justice.